Worth addresses the relevant financial, legal and lifestyle issues unique to high net worth individuals. From stories about dynamic wealth creators to expert advice on wealth management, the magazine is organized into three sections: Make focuses on wealth creation and entrepreneurship; Grow centers on wealth management and investing, and Live highlights philanthropy, lifestyle and passion investing. 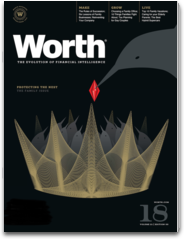 This app includes downloadable versions of all new issues of Worth via in-app purchasing, as well as the option to subscribe to get first access to all of the newest issues as they're released. Subscriptions are optional, and last for one year from the date of purchase and cost $49.99/year, and are automatically renewed until canceled. Your credit card will automatically be charged for another subscription period (another year for annual subscribers) unless you change your subscription preferences in your account settings. More interactive features and fewer bugs.. we hope you enjoy the changes.